To find trees in the desert, we often have to go up in the mountains. I grew up in the Midwest, so every once in awhile I get a yearning to see those tall plants that block the view. Yep, I have to admit that after living out in the desert for seven years and absorbing all the wide-open spaces, being surrounded by a lot of trees can make me almost claustrophobic! One way I can get around that is to pay attention to the trees that are surrounding me. 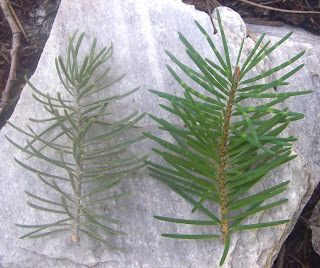 Today we're going to look at two in the Pine Family (Pinaceae) that are very similar--white fir (Abies concolor) and Douglas-fir (Pseudotsuga menziesii). Right off the bat I want to point out a couple things. First, both trees have fir as part of their common name, but Douglas-fir has a hypen; that's because it's not a true fir, it's in a different genus. In addition, pseudo means false. 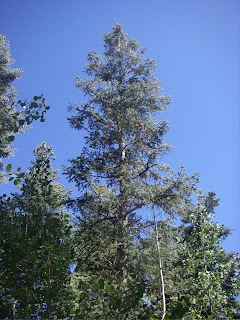 Both white fir and Douglas-fir are medium-sized conifers, living at similar elevations. With just a little close observing, it doesn't take long to tell them apart. 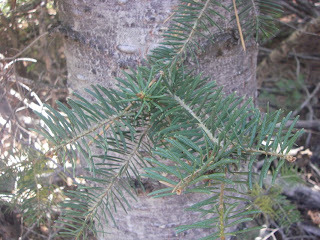 White firs have grayer needles (on the left in the photo above), and they are spaced out along the stem. 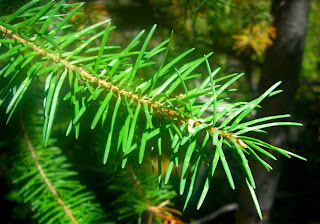 Douglas-fir needles are brighter green in color and look like they have been packed onto the stem. Looking closer at the needles (it's so fun to have macro and cropping capabilities! 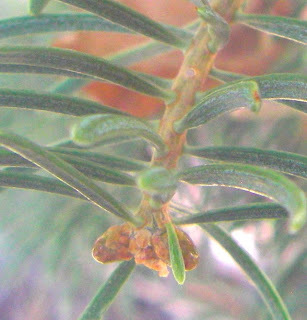 ), you can see that the white fir needles come straight off the stem at a nearly right angle. The needles themselves often curve slightly. 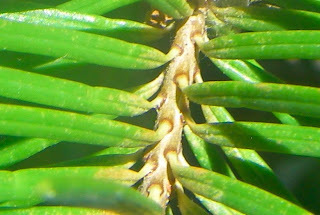 The Douglas-fir needles bend as they come off the stem. It sort of looks like they started growing in one direction (upwards) and then decided, naw, let's go out to the side, then we don't have to stand up so straight. The Douglas-fir needles are the "bad posture" needles, slumping. What's the tree in the photo above? Alright, I admit I'm a firm believer that in order to actually remember something, you have to be challenged to make it stick in your memory. (Maybe that's why I'm not a teacher, I would drive everyone nuts!) If you guessed Douglas-fir, you're right! Beware, there is another quiz coming up. Hey, keep reading, it's not like I'm going to give you a grade or anything. Okay, let's look at the pine cones. Since I'm often looking at the trail when I'm hiking, the pine cones are often the first thing that lets me know what trees are around. White firs have small cones that are rather plain looking. These cones are generally in clusters at the tops of the trees. Douglas-firs have little projections that come out of the pine cones and are slightly larger. 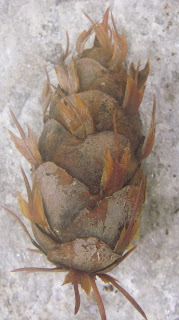 Let's take another look at the Douglas-fir pine cone. 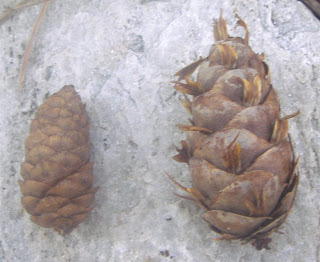 These cones are often described as having mouse tails sticking out of the scales. Okay, naturalists say that. Botanists say that the cones have a long tridentine bract that protrudes prominently above each scale. Say that three times with your eyes closed and while balancing on one leg. Back to the mouse tails--a Native American myth says that it's just not the tail, but also the little hind legs sticking out of the scale, because a forest fire was approaching and the little mice took sanctuary in the pine cones. 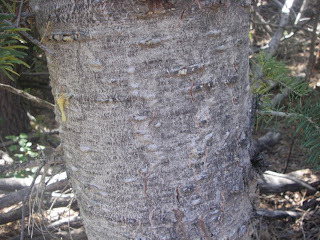 Another way to tell these two trees apart is the bark. Take a close look at the photo above and below, and then make a guess as to which is which. The last photo on the post has an extra clue as to which they are. I'll leave it to you to puzzle out in the comments and will chime in later with the correct answer. Douglas-fir is an important timber tree and is often used in construction to carry heavy loads and for homebuilt-aircraft. It's also the most common Christmas tree sold in the U.S. White fir isn't as valuable a timber tree due to weaker, knottier wood. 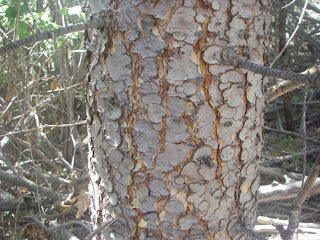 It grows readily in shaded areas on a variety of soils, and in our area is much more common than Douglas-fir. Flatbow has been watching too much Monty Python. I agree. It is the larch or perhaps a shrubery. The real question is: which tree, the Douglas-Fir or the White Fir, can you cut down with a herring? He's a lumberjack, and he's okay- he's sleeps all night and he works all day. You guys are funny! Flatbow, you are correct. I think I'd better leave it at that. Sarah, thanks for putting a song in my head! A song that won't go away. And Coloradolady just picked my entry for her Name a Photo contest--if you'd like to see, check out http://coloradolady.blogspot.com Thanks!!! I don't think either species makes for a good toilet paper substitute in the sub-alpine forest.